Prized for its spicy, aromatic rhizomes, ginger (Zingiber officinale) serves a prominent role in many Asian cuisines. It is seldom seen in plant nurseries due to its lack of ornamental value, but will grow readily from the rhizomes sold in most grocery stores. Ginger requires very specific growing conditions to perform well, making it difficult to grow outside the tropics. However, it is a relatively carefree plant if its growing conditions and care needs are met. Ginger rhizomes take up to one year to reach an adequate size. Ginger originated in the tropical region of Asia, where it has long been cultivated. It requires warmth to perform well and will only grow outdoors year-round within U.S. Department of Agriculture plant hardiness zones 8 to 12. Temperatures between 75 and 85 degrees Fahrenheit are ideal for growing ginger, and the plants must be brought indoors when nighttime temperatures dip below 50 degrees Fahrenheit. In climates north of USDA zone 8, it is best to grow ginger in pots so it can be brought indoors when temperatures grow cold. Garden and pot-grown ginger both require similar growing conditions. They perform best with two to five hours of direct sunlight daily, some light shade during the hottest part of the day and protection from drying winds. Loamy, fast-draining soil is ideal, but they will tolerate slightly sandy soil as long as it drains well. 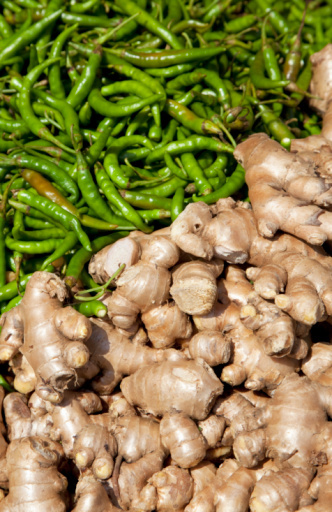 Space garden-grown ginger plants at least 2 feet apart to accommodate their mature spread. For container cultivation, choose a 12- to 14-inch azalea pot and fill it with a compost-enhanced potting soil. In winter, move potted ginger plants indoors to a warm, sunny room where temperatures stay above 50 degrees Fahrenheit. Ginger needs abundant moisture to survive, but it will rot if kept too moist. Provide roughly 1 to 2 inches of water weekly during the active growing season, wetting the soil in the top 12 inches. Let the soil dry out in the top 2 inches between waterings to prevent rot. Water pot-grown ginger whenever the soil feels dry beneath the surface, adding water until the soil is saturated and the excess drains off. In hot, dry areas, mist ginger plants daily to keep their foliage hydrated and healthy. Reduce watering by half in autumn and winter, adding just enough water to keep the ginger from wilting. Moderate to high levels of nutrients are required for ginger plants to produce plump, healthy rhizomes. Loamy, organically rich soil provides a steady base supply of nutrients, but the plants will benefit from a monthly application of organic liquid fertilizer such as liquid kelp. Mix 2 tablespoons of liquid kelp with 1 gallon of water. Water the ginger plant with the kelp solution once every three to four weeks, taking care not to splash it on the foliage. Apply the fertilizer solution from spring until late summer, withholding it in autumn and winter. 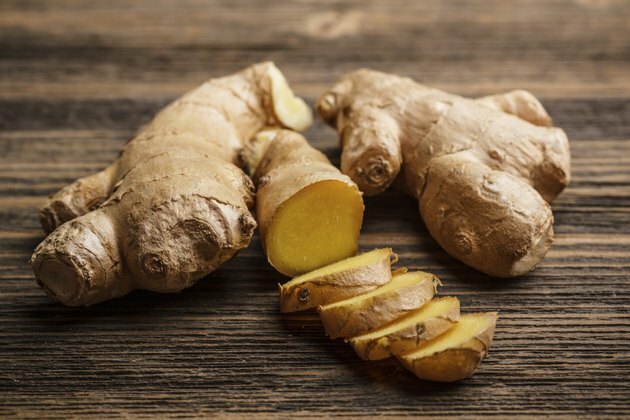 Garden-grown ginger plants also benefit from a 3-inch layer of compost around the base, which will help regulate soil moisture while providing extra nutrients as it breaks down.